My wife and I rented the property for 2 weeks and invited 3 couples to join us. There was plenty of room, with even a 5th bedroom left vacant. The photographs on the site are accurate and show the property well. We had our breakfasts at the big kitchen table and, when we were home for dinner, ate in the large dining/living room on the second floor at a beautiful table that would have easily sat 10 people. The layout is as follows: on the first floor there are two bedrooms (1 king and one with two twin beds), a nice sitting room and a full bathroom. The second floor has 3 bedrooms (two queens and one other room with two twin beds), a beautiful, well-equipped kitchen, two full bathrooms (I with shower, one with a tub/shower) and a large sitting/dining room with windowed walls on either end. There is a nice dining table outside next to the propane grill, a large hammock and then stairs leading down to a nice pool equipped with plenty of seating options. Raffelele, one of the owners, is both a chef and a wine expert (The house is stocked with a wide range of wines with the price listed on each bottle). We contracted with Raffalele to cater a dinner at the house and it was wonderful. He brought linen and tableware, as well as a series of wines with each of the multiple courses. It was luxurious (dare I say decadent) to be served a perfect 2-3 hour meal in our own "home". I have worked in a variety of restaurants and I have to say that Raffalele's service was a good as any I have had anywhere. The house is located about 20 minutes outside of Borgo San Lorenzo (north of Florence on the A1 Autostrada). Borgo San Lorenzo has a convenient train station with free parking and trains that will get you into Florence quickly and comfortably (we recommend not driving in Florence). There is a also a big supermarket there where we did our shopping. As for other places to visit, Siena and Lucca are each well within two hours by car. We also recommend San Gimignano, Montecatini, Barga. Monteriggioni and Montalcino as wonderful small towns to visit. Barbara Vanucci was our main contact and she was great - she contacted us in advance with directions and useful suggestions and was available at all times for any questions. SMALL CAVEAT - the house is up in the hills and the drive up was a little daunting the first time, but don't lose heart - RENT THIS PROPERTY!!!!! We work every day to maintain and preserve Villa Poggiolo an authentic Tuscan farmhouse. Here our guests cas rediscover history, aromas and flavors. We staid for one week and had a great time! We where 9 persons and had no problem at all since there is 5 bedrooms and 3 bathrooms. We just loved the BBQ-area where we made food and had some good local wine. There is lots of good wine in the house also that you can bye. The pictures are beautiful, but it's even more beautiful on site. The garden and the view over the valley is incredible! Only problem was that we only staid for one week :) 20 min drive to a great and big Coop where you can bye food. Also 20 min drive to the train station where you can take the train to Firenze. You need to have a car if you stay here, and I don´t recommend a sports car since the last bit of the road is a bit bumby. Barbara, the owner is fantastic to. We just loved it and hope that we can revisit Villa Poggiolo soon again! We are who thank you: you allow us to introduce in our land, in our farm, in a unspoilt nature, for an exchange of emotions. We've had a wonderful time at Villa Poggiolo. It was at a great location in the middle of Tuscany, among the green hills of Mugello. We had two small children with us, and the garden provided a lovely safe space to play outside. The house was exactly like what you see on pictures en in films about Tuscany. Very old and pretty, which really added to the atmosphere. The location also was at a good driving distance from a lot of the cultural en nature sights you would want to visit in Tuscany. We felt very welcome by our hostess, and I personally was quite sad to leave after one week. So I recommend other visitors to stay at least two weeks. Villa Poggiolo has been blessed by nature, we only try to keep it intact and authentic for our guests ; hopefully our Guests rediscover with us, the time of the their soul. We rented Villa Il Poggiolo as a family of 8 people, including four children, the youngest being 18 months old, and it was suitable for all ages in our group. (Within a day of our arrival the owners very kindly brought a trampoline for our children to use). 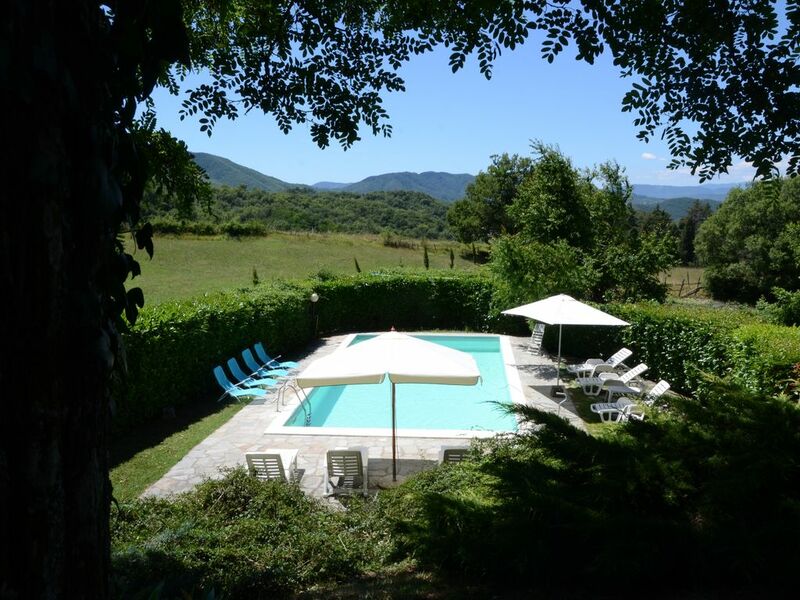 The property is in a stunning location surrounded by fields and forests, and with wonderful views over the hills and valleys. The location of the house makes it suitable for those that enjoy resting, walking, nature, and excellent food and wine. We were surrounded by wildlife, eagles, deer (including a fawn), foxes, hedgehogs, bats and snakes (totally harmless). Barbara and Raffalele were perfect hosts during our stay and couldn't have been more helpful and welcoming. Please don't miss the opportunity to have Raffalele's food and wine tasting evening in the villa. As well as cooking you excellent food, he is a very knowledgeable sommelier and you will sample many fine wines. Our children and grandchildren thought that this was the best holiday that they have had, and are still talking about it weeks later. Villa Poggiolo was blessed by nature indeed, we try to keep it intact and authentic for our guests, to buy back the time of the soul. "we had a wonderful stay in this magnificent house ! the welcome was warm and the owner was extremely helpfull with practical issues! We enjoyed our holiday ; the swimmingpool was super and also the view was breathtaking ! the house is beautifully decorated and very cosy . Problem nr 2 : windows need screens to prevent insects to enter kitchen en bedrooms ! And a guideline how to use the oven would be nice"
This is a fantastic place. The views over the valley are great and silence is golden. The accomodation was as we expected it and was very good. Because the place is high up on the side of the valley it gets a nice breeze. The swimming pool also had some problems with the filters and lights. We also lost all our water to taps for about 1/2 a day. I would suggest that the owner considers adding a dishwasher and some nice heavy shutters on a couple of the bedrooms that currently do not have them. The shutters do help to keep the rooms cool. We really enjoyed our stay and will probably go back again some time. The region around Borgo is lovely - lushushly green yet hot. If you go to Florence - take the train from Borgo.